The Patriots Athletic Club is a Volunteer Organization that directly supports the Athletic Department at AFHS! Membership to the PAC gives you access to all Home JV and Varsity Games (excluding endowment, playoff and tournament games (per NCHAA rules). Memberships are non-transferrable and non-refundable. Membership to the PAC gives you voting rights at all the Patriots Athletic Club General Meetings, typically held at the end of each sporting season. MEMBERSHIPS PASSES HAVE GONE MOBILE! How many passes come in a Family Pass? If I purchase a Family Pass, how does that work? When you select your purchase, you are asked to create an account with a username/password. 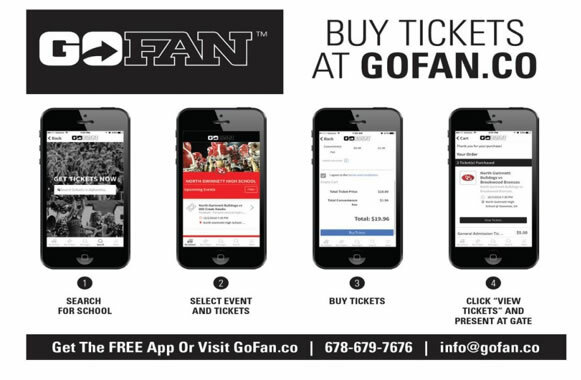 Each Family Member will need to download the Free GoFan app on their smart phone. When they open the app they will need to enter the same username/password created for your Family Account. Everyone will login using the same credentials. Each Family member should see the same information on their phone. I purchased a Multi-Year pass that has not expired. How do I access my passes? As a Multi-Year member, when I go to GoFan to select my purchase should I enter my original purchase or the number of years left on my account? As your email instructions should state, you are to select the number of years LEFT on your Membership Pass. Then enter your promo code as instructed. Will our family be able to enter the gate at different times? Yes. If you purchase a Family Pass, on the app you will see 5 “tickets”. If only 2 people are entering, then only 2 tickets will be REDEEMED. The remaining 3 tickets will still be available to other family members and it should show the 2 REDEEMED tickets on everyone’s app. What if I want to attend 2 events on the same day? Your admission to any WCPSS event is similar to any paper ticket admission. You are expected to remain in the venue – you are not free to roam in and out of the venue. Each Mobile Pass will refresh 1 Hour after it has been redeemed so that you may be able to attend other events. I am purchasing a Student Pass for my Teen. What email address should I use, the student or parent? We recommend using any email address that you would like to receive information from the Patriot Athletics Club. Just ensure that your teen knows the email you associated with the account for them to access it on the Mobile App. What do we do if we have a family member that does not have a smart phone? Contact Jennifer at We have a small amount of hard cards specifically for those family members that do not own a smart phone. How can I get in the gate if my phone isn’t working? There will be a printed list of all PAC members at the Gate in the event your phone isn’t working.